The print version of today's revamped New York Times Magazine featured an essay by one of my favorite writers at the moment, Teju Cole. Cole, a novelist, art historian and photographer, is also the magazine's photography critic. In this week's piece he takes a close look at the photography of color. Specifically, he discusses the way people with dark skin have been photographed by black photographers over the last 50 years. Back when Oprah Winfrey was hosting her daytime talk show, people would often joke about how her stage made everybody look good because the lighting and camera filters were calibrated show the depth and variance of black skin, therefore giving an attractive glow to all skin colors. I'm sure Oprah is more than smart enough to see the irony of her stage making black, white, caramel, beige and tawny skin beautiful while she and her production team broke through so many racial barriers. The fact is, cameras and film (you know, that stuff that had to be developed before there were computers to do it for us) were made and calibrated for the majority of the people who would be using them at first...as in when such equipment was first invented. They were calibrated to capture the reality of white skin for black-and-white or sepia photography. The flat homogeny of black, hispanic or Asian skin in the professional photography of the 1960s - 1980s (90s?) is clear in color or black-and-white. It was a technological flaw that was bemoaned by few, but, as Cole highlights, there were some who were able to take the tools at hand and use them to make important statements about race and societal vision. The work of pioneers such as Roy DeCarava and Gordon Parks paved a way for today's photographers and cinematographers to explore image and racial perceptions at an incredibly conceptual level, using tools that are better made to work for everyone. It was exciting to read Cole's take on this, especially with the mention of Selma on the day of the Academy Awards, which is giving the movie an annoying snub* (and to see Danai Gurira used as a model to show how such explorations have evolved**). — Teju Cole. "On Photography: What is dark is not empty; if you know how to see, there are glories in the shadows." Take a look at the essay. What do you think #DiversityMeans in artistic vision today? Hopefully more writers like Cole will continue to force us to consider answers that will lead to more equitable representation of the many lives that intersect and play themselves out in our country. *This link to David Carr's Jan. 18 article made me pause. The NYT columnist's death just 25 days later rocked the American writing world. **Because it's always fun to read a national piece and pretend like you're besties with someone in it, because once, in a crowded room full of people who were also dying to talk to the celebrity, you had a cool conversation about artistic process with her. It's time to talk. And we're starting NOW. I'm going to make you get comfortable with talking to others and looking inside yourself. Every day our social media feeds are inundated with listicles, weird news, and other tidbits. It can be fun, but sometimes it’s overwhelming to have so much content rolling before our eyes while more and more of it is devoid of real meaning. I love where I live. I’m appreciative of the rights I have. Especially when traveling abroad to progressive countries and finding that many things I take for granted aren’t so easy for every modern society. Like… you guessed it… the internet! But here’s the rub… we while so many things come easily to Americans, we can’t talk about the things that are important. These topics are the rubber bands wrapped around the core of what entitles us to those rights. Who qualifies as being a fellow human? How do we treat our fellow humans? The way we want to be treated? Does that mean we have to be best friends? Does this mean we have to understand each other? It would seem that these questions should have already been solved by the scholars, priests and philosophers who shaped our human moral code, correct? Yet as the world grows smaller through the lens of listicles and blurbs, one might come to the conclusion that fewer people have received the messages of the sage ones than one would suppose--which I hope isn't actually true. As we peer even deeper into the wider population’s interpretation of these moral codes, we’re forced to examine the accuracy of those interpretations within ourselves. How are they stacking up to the original grand ideas that were once placed before us? On American soil (and on other soil, but I don’t have enough knowledge to delve into that today), the cultural lexicon has managed to place the word diversity within the margins of these big questions. 'Diversity', as a word, has been removed from it’s original context. 'Diversity' has become a cultural marker for discomfort. 'Diversity' has become something that gauges how much self-evaluation we are capable of handling. Honestly, I was surprised to see the definition of the word written with so much modern cultural context. I don’t have proof at the moment, but I feel positive that 20 years ago the definition was much more scientific. The book I’m writing is technically a memoir, but in my case the genre (to allude to M-W again: a written account of someone or something that is usually based on personal knowledge of the subject) is a means to an end. I’m using my past experiences and those of my family as a doorway that opens onto a conversation people have never been willing to have. Nick Kristof’s idea of a White House-sanctioned truth and reconciliation commission on race in America seems to have gone unnoticed. Probably because stringing such words together makes 2015’s political players a bit hot and stuffy under the collar. We cheer and jeer at the outlandish Facebook posts of our contemporaries as candidates and analysts watch, leaving the professional political crowd to believe that the mention of a word as powerful as diversity will put the next voting cycle at risk. image via public domain. words via Dr. Martin King, Jr.
Are you ready to talk about it? Are you ready to burst through the discomfort to arrive at a place where we won’t cringe at the idea of examining our moral core? It’s actually going to be quite easy. You’ll forget that you’re learning anything. You’ll forget to sweat. I think you may even have quite a bit of fun. Off the top of your head, what is the “textbook” definition of DIVERSITY? 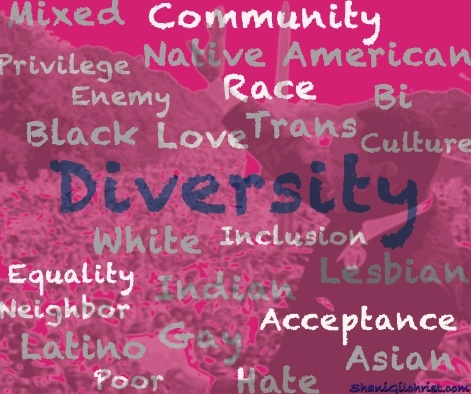 What is your personal definition of DIVERSITY? How does this personal definition of DIVERSITY reflect or differ from the examples you saw or lessons you were taught growing up? Why is DIVERSITY is so polarizing? Will DIVERSITY ever just be a word? Since I’m the one pushing this on, it wouldn't be right for anyone but me to be the first guinea pig to answer the questions. So, without further ado, here’s my (slightly imperfect) YouTube video, featuring a look at what #DiversityMeans. *admittedly, drinking hefeweizen in the bar with Aaron and his colleagues while waiting on uploads wasn't incredibly helpful. extremely fun, but not very good for expediting the task. **There's going to be SO much on this later. Brace yourselves! ***be sure to follow me on twitter, facebook, pinterest!